Hello again! 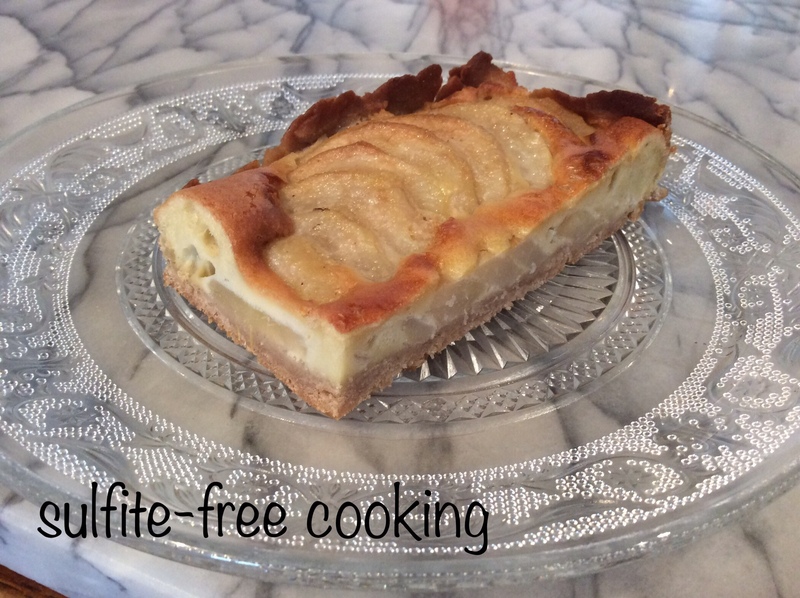 Here is the recipe for the gluten-free pear pie that I had promised you. Very easy, and very tasty. The last time I made it I doubled the quantities, and got a 12 serving rectangular pie. Never in my life, even back in my days of gluten baking (and belly aches), had I made such a large pie! Everyone loved it, even my uncle who took seconds, not realizing the dessert had been made with a fruit he supposedly dislikes! Please note that the pie in the photos was a double size, serving 12. 1. Make the pie dough, spread out onto the frame or pie dish of your choice, although I personally think rectangular is best for conveniently layering the pear slices. I have an expendable frame, very handy! I placed it on top of a baking tray before fitting the pie dough into it. Reserve unbaked pie shell in the refrigerator. 2. Blend together cashew butter, sugar and eggs. Set aside. 3. Chop off about ½ inch from the pear tops – too small to use in the pie. Don’t throw them away, add them to cook with your morning oatmeal or to a fruit salad. Waste not, want not! Core, peel and cut pears in halves pears. Slice halves from top to bottom. 4. Place slices on pie dough, sliding them in one half-pear blocks and lather in egg mixture. Bake for 45 minutes, covering with foil after half an hour. Remove from oven and cool on rack. I know I will be making a summer version of this pie with nectarines. What about you, dear neighbors? Nosy neighbour here, what kind of pears are those? They look really interesting. The tart, er, pie?, either way turned out wonderfully.